However good the work is that you do within your organization – whether you’ve got a product or service to share, or you’re hard at work creating opportunities for your community – it is increasingly hard to keep things going without a bit of publicity to remind customers, investors, and participants of what’s going on. 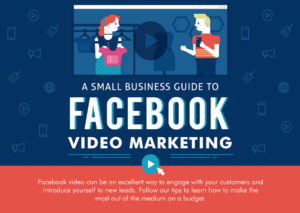 The ideal solution fell into our laps recently, with the new wave of Facebook video marketing: an approach that needn’t cost a penny, but which can be scaled up according to each organization’s needs. You don’t need a whole lot of fancy equipment to make your videos. 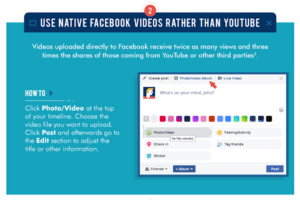 Facebook audiences appreciate honest, personal videos. 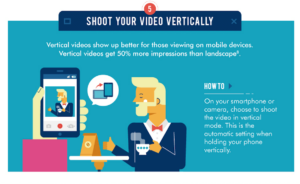 You can even do it on your smart phone – indeed, with vertical (portrait) videos getting up to 50% more impressions than horizontal (landscape) ones, video phone conventions can be said to be the native language of the Facebook video. 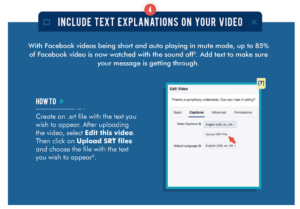 Topic wise, your video doesn’t need to be a flashy, cinematic commercial. 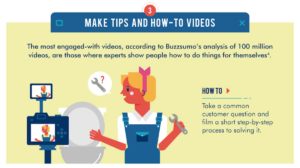 Social media experts at Buzzsumo investigated 100 million Facebook videos and figured out that what works best is a video that offers some value beyond its attempts to promote or sell whatever it is the organization does. So if your organization helps young people to start up their own small business, don’t make an advert that wastes its two minutes inviting young people to come in and sign up; instead, tell a two-minute success story about someone you’ve done it for already, and simply add your ‘call to action’ at the end and in the supporting text. If your company sells bikes, don’t make a thrills-and-spills bicycle commercial, but instead a ‘How To’ video on how to mend bike brakes, or a mini-documentary about the local cycling scene. Sounds like something you could make use of? 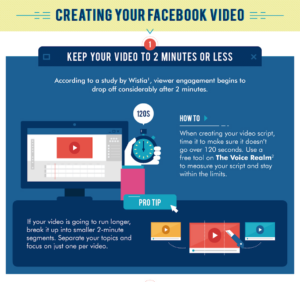 Take a look at this new infographic which covers all the basics on how to get your Facebook video right. Then pick up your smart phone, and you’re ready to go! Graeme John Cole is a digital nomad and freelance writer who specializes in leadership, digital marketing and personal growth. His passions include world cinema and biscuits. G.J Cole is always on the move, but can most commonly be spotted in Norway, the UK and the Balkans.